This made me realize: We're kind of a remote team. After his internship ended, our second team member Ruben moved away from Berlin to do his Masters' degree in Dresden. Keeping him as a working student was a no-brainer to us. With 2 people already being remote, it was no big deal for us when André joined the team as a part-time developer, working in the early mornings after he brought his kids to the kindergarten and daycare center. And yes, we're not a "remote-first" team. All full-time team members are still in Berlin. A lot of stuff is still discussed in informal meetings on the way to the coffee machine. 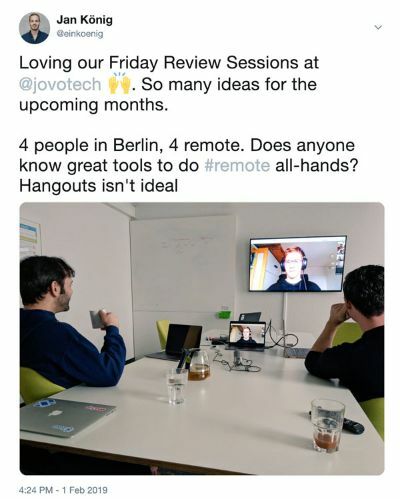 But having several people on the team who don't work from the Berlin office let us think about ways to make our team communication more remote-friendly. #daily Slack channel: Instead of focussing on in-person daily stand-ups, we created a Slack channel that serves as some sort of asynchronous stand-up feed. Whenever someone starts working, they post in there what they will focus on for the day. This increases the transparency and helps remote team members to learn about what everyone else is working on. Friday Weekly Review: As the #daily channel just scratches the surface, we designated 1-2 hours on Fridays to have everyone (who wants) show something they've been working on. This usually ends up in a fun brainstorming where we discuss future product updates. Weekly 1-on-1s with me: Ideally after the review session on Friday, I check in with the team members to talk about goals and tasks for the next week. We moved this to end of the week because it feels more relaxed. No one wants to start their week with a Monday of "planning" instead of "doing". Weekly 1-on-1s with Alex: We noticed that it's difficult to learn from each other when doing remote work without really dedicating the time. This is why Alex started doing technical 1-on-1s with the team members to give them space to ask questions and request feedback on certain things. Culture: Unfortunately, remote team members miss a lot of non-work-related things in the office: having lunches as a group, a co-worker bringing cake, the morning walk to the coffee machine... Those are the times where other things than work are talked about. Feedback: Although we have the 1-on-1s, we need to work on better feedback processes. Hardware: Voice app testing can be tedious (some people have creative ideas) and difficult to to when you don't have all the devices. Being a remote team means we can't just buy one or two devices from each type and then pass them around for testing. Do you have remote team members? How do you manage the communication?